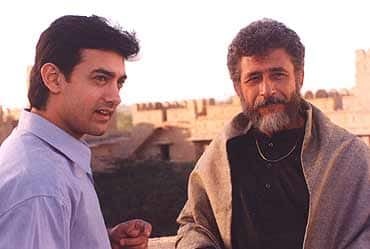 Sarfarosh is close to my heart because it was the first film in which I had started noticing the critical elements like the screenplay, direction and how background score affects the on-screen emotion. In a way, I had kick-started my appreciation of cinema with Sarfarosh. There is a myriad of films in Indian Cinema that showcase secularism and most of the time, the presentation becomes grandiloquent. In Sarfarosh, what John has done is that he has kept it as a part of the narrative. He hasn’t “tried” to show how biases work in Indian Police but rather has shown how our Muslim brothers feel in India. The filmmaker is again sensitive to show the flip-side of the coin by showing that how India is motherland to most of the Muslims and how they can do anything to protect their nation. The scene in which Ajay Singh Rathod hugs Saleem gives me goosebumps even to this day. It was early in the life lesson in secularism for me. There are multiple villains in the movie. Even though all are connected but it’s always difficult to handle so many characters at the same time. The filmmaker is, of course, guilty of using the cliché of killing the characters to focus on the key events but what’s so good about John’s way of making the film is he uses the deaths of the character as subplot points in the screenplay. The deaths become key incidents in their own individuality and help in the progression of the story. The underrated filmmaker has tied the narratives of Sultan, Bala Thakur, and Veeran so tightly that even as a kid, I could understand their association and how things worked. Okay, I just love Bollywood Dialogue-baazi; and the writer has aced it in Sarfarosh. Right from “Mera Mulk Mera Ghar Hai”; romantic dialogue exchange between Ajay and Seema to the polished Urdu dialogues of Gulfam Hassan; I loved every bit of it in Sarfarosh. I could keep on iterating dialogues of the film here, but, “Chintu aa gaya”. Teehee! If I am to pick out the best performance by Aamir Khan from his entire filmography, it has to be Sarfarosh. His acting forte is quite evident in the hospital scene wherein a man surreptitiously enters his room to threaten him and he jumps on him like a Tiger. What follows is a chest-thumping sequence wherein he tries to catch him but fails. The event ends with a sardonic laughter on Aamir’s face. I wonder if anyone else could have pulled that shot the way Aamir has done. More importantly, I am still curious about how many takes it had entailed? Apart from Aamir, Naseer Saab looks like a hand-in-glove for the role of Gulfam Hassan but I won’t say it is his career-best because he has given so many great performances. He has a terrific understanding of the characters he plays. I loved Sonali as the mischievous and stylish Seema in the film and she adds a bit of lightness amid a highly captivating scenario. The rest of the characters are unforgettable too. Thanks to the terrific acting skills the actors are bestowed with. Sarfarosh also shows the struggle and hard work of Indian middle-class people who go on to become Government Employees after qualifying through a very difficult UPSC examination; and how many of them are actually serving the country rather than hiding their actual talent under the table.